Village society (or any society) can not progress without having equal opportunity to participate in a wholesome education. 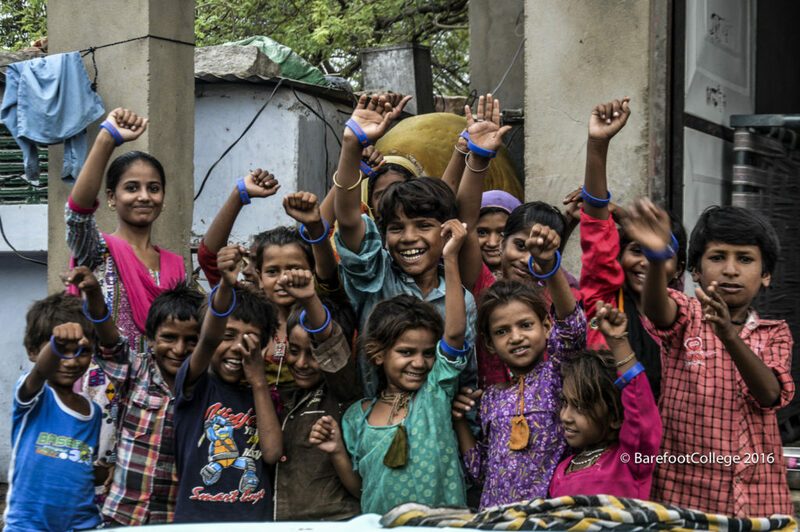 In the state of Rajasthan, India we find the highest disparity in Primary School attendance. Of all the girls eligible to be in primary school, 64% attend (1). Earlier studies show us that 12% are not enrolled at all (2). Day by day our Education Department emphasizes a hands-on, learning-by-doing approach that focuses on poor, isolated communities (like Malala’s) in order to tackle social norms regarding gender and access to education. 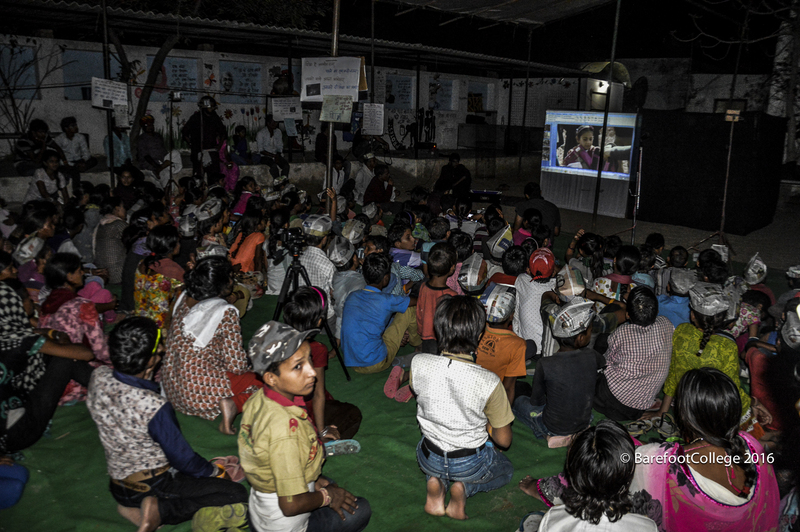 A deep appreciation for the Rural Hero lies at the heart of our curricula, so naturally; we took the responsibility to spread this message in remote Rajasthan, India using an inexpensive solar operated projector. The idea was to show the struggle and triumph of Malala Yousafzai. Barefoot Comms Team sets up solar lights and stage for the show to begin. 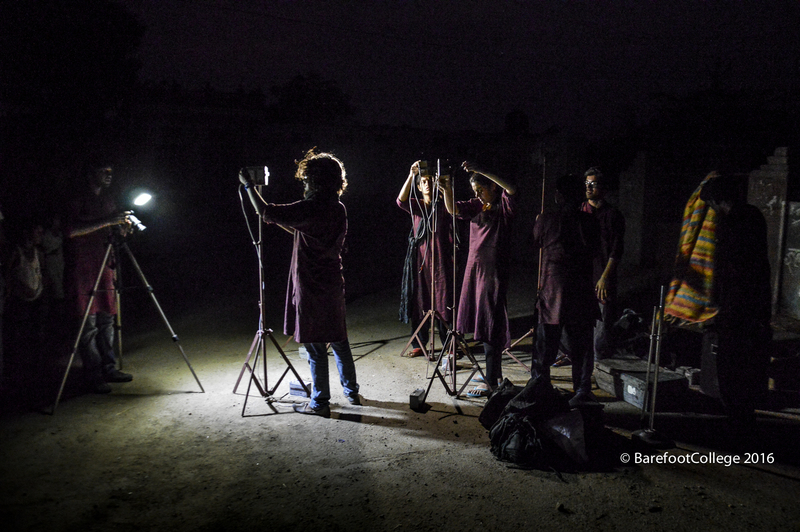 The design was built by barefoot photographer, Ramlal – a night school alumni. 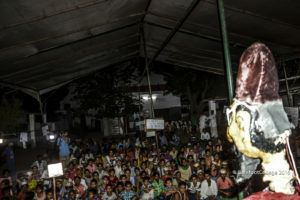 Jokhim Chacha, a very famous puppet, handled by Ramniwas Ji introduces the children to the movie. 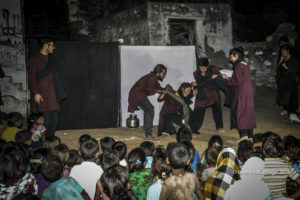 Traditionally, Barefoot College has always communicate the powerful message of girl’s education through puppet shows and street theatre attended by hundred throughout the night. Some have even come to join the communication department after graduating night school and formal school. Now, for the first time, we were proud to be able to showcase a documentary, powered by renewable clean energy, relatable to the rural desert lifestyle. 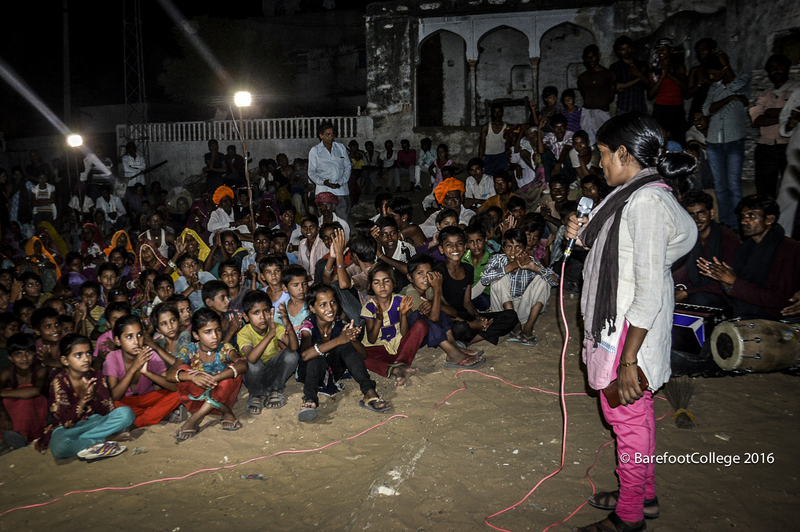 The MALALA Project has had a great impact, reaching out to 4,000 people in 12 villages of Rajasthan. 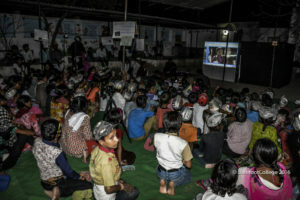 In total 40,000 villagers from 80 villages watched the documentary. The response from the older rural women was unexpectedly positive. We attempted to reach communities where sending girls to school is still not considered important. After the Movie, a street play presented the story of a young illiterate girl trapped in the cage of social ordeal. She is forced to stop her dream of learning how to read and write and her mother, who after facing husband’s death, loss of their land, considers suicide, but not before exchanging dialogue with a neighbor to finally realize the merits of educating her daughter. The Dramity-Dramatics team from Amity School of Economics perform the struggle of a girl who wishes to study. 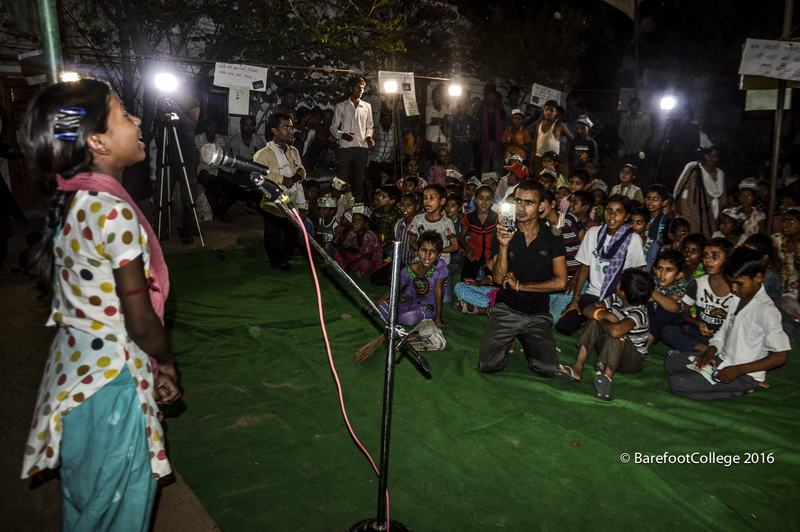 Sharwani Gujar (Alumni of night school) is the first female Sarpanch (elected Village Head) of Kalyanipura Village. At 22 years old she is the most educated woman of her village by completing her B.Ed and pursuing a Masters. 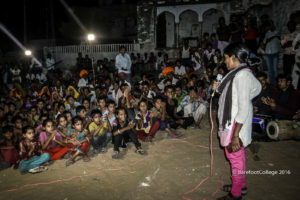 She is seen here sharing her struggles as a girl who fought for her rights to study and stood against a patriarchal paradigm. Pooja Devi, a 12 year old Sarpanch of Singla Residential Bridge explains before coming to Singla she used to help her mother in daily household chores and that her daily routine was similar to a typical girl in a rural village. Now she loves to study and wants to go for higher education and become a teacher. This attempt to share a simple message from a brave girl in Pakistan revealed many similar stories within the Rajasthani villages we visited. The following testimonies were documented during the campaign. Komal – A girl from Megwal (Labour class) community who currently is studying in class 11th believes it’s a right for each child to attend the school. In her village maximum girls drop out after secondary but she had the courage to break the stereotype and go ahead with her ambition to study. 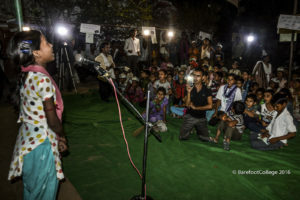 She believed education gave her the confidence that she can stand for her right and she thanks the night school and Manthan day school in which she studied and gave her an opportunity to dream. Sonu Rao – Ex. Education Minister of our 8th children’s parliament and completed her class 7th from a government school now would be joining Vansthali a private school for her future studies. According to her “Education helps kids to fly to achieve their dreams and remove any doubts and fear. For her each and every girls should study so that they can break the orthodox approach and become fearless with education they can even help in their household chores. In future she wants to be a honest doctor and people of her village. Kamla Devi – A crèche worker in Barefoot College came forward in Nallu and gave an inspirational message to her villagers “ Going to school is important and one should definitely send kids to schools but all of you should first enrol the your kids to pre-primary school as that’s our first step toward ensuring quality education. 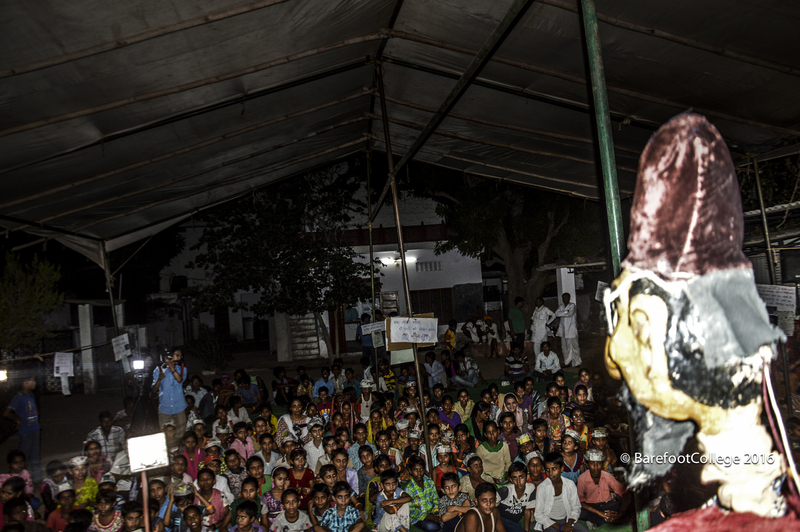 Bhagwan Das – Bhagwan Das first Dalit Sirpunch of Roopangarh village has a truely inspirational story. Before being a Sirpunch whenever he entered sirpunch’s office he was not allowed to sit in the office and at that every moment he decided he needs to have power to bring a change. For him education gave him an opportunity to know about his rights and that helped him achieve his dreams and be a Dalit Sirpuch. He wants every youngster to bring a change in their community and education is a surely the first step. Hemnath Ji – He is a member of our communication team and a classical singer from a Kalbaliya community is an illiterate person but today he writes a daily dairy about his work and the coordinator from the communication team refers to his dairy for any confirmation. He started learning late but during the programme he had a message for all adults-“Learning should never stop and all the adults should learn how to read and write so they are not depended on others and no one cheats them. Mangilal – A 65 year old and respectable person of his village in Nava Gaav Sarot shared his views about how he has seen education develop over the years. He 2 brothers and a sister and his family were the first one from the village to send a girl to a school. Today her daughter have secured a government job and he thinks the kind of respect he commands in the village is because the girls of his family made them proud. 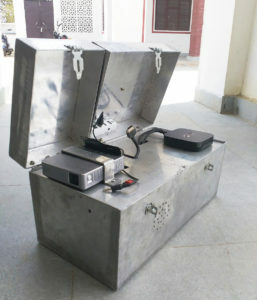 For the next month; we will continue to bring our solar project to villages in Bihar, Uttrakhand and Karnatka as well. A big thanks to our partners at Skoll Foundation, Participant Media and Oracle Corporate Citizenship for all the support they have brought to the initiatives of our Education Department.